Whether you've added a new dog to the family or are considering doing so, this booklet is for you. The OVMA, the largest veterinary association in Canada, aims to help educate new and would-be pet owners on how to help your dog live a long, happy and healthy life. Select the cover to download the Dog Owner's Handbook. 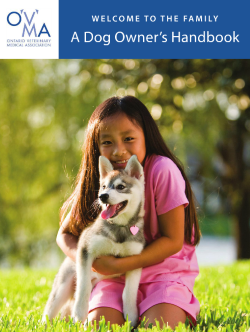 For more information on any of the topics contained in the handbook, ask your local veterinarian.